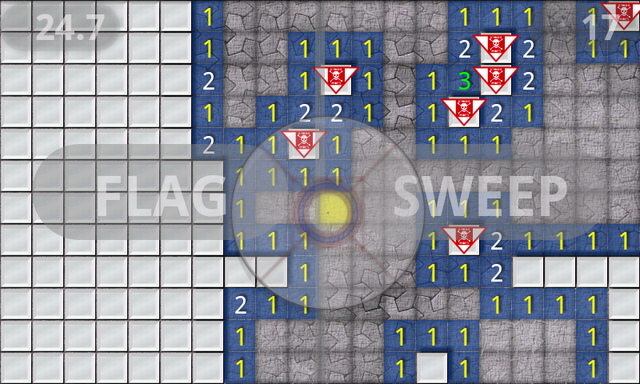 Hoversweeper is yet another minesweeper clone. 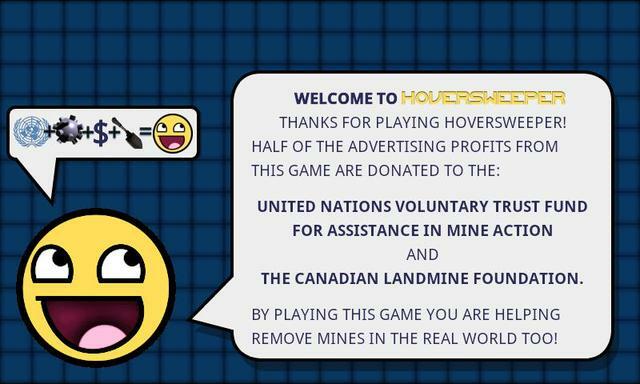 Half of the advertising profits go to removing real landmines. There’s basically three ways to make money on Android. I went for option 2 and I chose to tie my success with helping people. Oddly enough, I haven’t seen that yet on the Android Market except for dedicated charity apps that go with option 1 above (and Google taking a default 30% cut). I’d love for this idea to take off in general. If I (or any other developer) is going to waste your time, you at least get the warm fuzzy feeling of knowing your procrastination actually did some good. It has been out a month and I think I’m hitting 5k downloads on the Android Market sometime today or tomorrow. It’s growing, I’ve got great ratings, pretty decent retention ratios for current users to total number of installs, and 100k ad requests. That’s more than 20 plays per new user (ads are only shown between games, not during). And that’s on average, whether they get rid of it or not. Fixed that. Hoversweeper uses the accelerometer and the left and right side of the screen as buttons to do the flagging and the digging. Gameplay is fluid. You can even play on an HTC Status with a 2.6″ screen with the 24×10 tile board. (And there’s no scrolling off the board. You get to see everything all the time.) There are a couple other ways to play as well, including the ‘classic touch’ interface, with an attempt to make that work better too. The default way, “tilt mode”, is just as quick as using a mouse on Windows though. I have the co-ordination of a sloth and I easily finish a game at hard difficulty in under 30 seconds and that includes flagging every mine. TBF, I have seen some decent attempts to make the genre work on a touch screen. I’m not a big fan of HUGE tiles, but it works. I hate the scrolling though. Interesting attempts that I have seen: a draggable mouse pointer and auto flagging (as there is no right-click on a touch device), and one where the selection tile remains fixed and the board moves instead (that one gave me a headache). You might have noticed that I appropriated a certain ubiquitous smiley. Any self-respecting minesweeper game has to have a smiley. The pondering over the idea to donate half of the profits to landmine removal and the design of a smiley were happening concurrently. It was an awesome idea, ’nuff said. This entry was posted on 2011.12.01, 12:39 and is filed under android, android development, android software. You can follow any responses to this entry through RSS 2.0. Both comments and pings are currently closed.